“Badges, we don’t need no stinkin’ badges.” Who said one of the most famous lines in film history? As it turns out, nobody. Several of the best people in Hollywood grew, noticeably, during their years away, at war; the man who grew most impressively, I thought, as an artist, as a man, in intelligence, in intransigence, and in an ability to put through fine work against difficult odds, was John Huston, whose San Pietro and Let There Be Light were full of evidence of this many-sided growth. I therefore looked forward with the greatest eagerness to the work he would do after the war. His first movie since the war has been a long time coming, but it was certainly worth waiting for. The Treasure of the Sierra Madre is Huston’s adaptation of B. Traven’s novel of the same title. It is not quite a completely satisfying picture, but on the strength of it I have no doubt at all that Huston, next only to Chaplin, is the most talented man working in American pictures, and that this is one of the movie talents in the world which is most excitingly capable of still further growth. The Treasure is one of very few movies made since 1927 which I am sure will stand up in the memory and esteem of qualified people alongside the best of the silent movies. And yet I doubt that many people will fully realize, right away, what a sensational achievement, or plexus of achievement, it is. You will seldom see a good artist insist less on his artistry; Huston merely tells his story so straight and so well that one tends to become absorbed purely in that; and the story itself—a beauty—is not a kind which most educated people value nearly enough, today. This story and Huston’s whole handling of it are about as near to folk art as a highly conscious artist can get; both also approach the global appeal, to the most and least sophisticated members of an audience, which the best poetic drama and nearly all the best movies have in common. Nominally an adventure story, this is really an exploration of character as revealed in vivid action; and character and action yield revelations of their own, political, metaphysical, moral, above all, poetic. The story unfolds so pleasurably on the screen that I will tell as little as possible of it here. 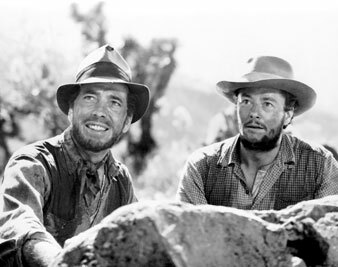 Three American bums of the early 1920’s (Walter Huston, Humphrey Bogart, Tim Holt) run into lottery luck in Tampico and strike into the godforsaken mountains of Mexico in search of gold. The rest of the story merely demonstrates the development of their characters in relation to hardship and hard work, to the deeply primitive world these modern primitives are set against, to the gold they find, and to each other. It is basically a tragic story and at times a sickeningly harsh one; most of it is told as cheerfully brutal sardonic comedy. This may be enough to suggest how rich the story is in themes, semi-symbols, possible implications, and potentialities as a movie. Huston’s most wonderful single achievement is that he focuses all these elements as simply as rays in a burning glass: all you see, unless you look sharp, is a story told so truly and masterfully that I suspect the picture’s best audience is the kind of men the picture is about, who will see it only by chance. But this single achievement breaks down into many. I doubt we shall ever see a film more masculine in style; or a truer movie understanding of character and of men; or as good a job on bumming, a bum’s life, a city as a bum sees it; or a more beautiful job on a city; or a finer portrait of Mexico and Mexicans (compare it with all the previous fancy-filter stuff for a definitive distinction between poetry and poeticism); or a crueler communication of absolute desolateness in nature and its effect on men (except perhaps in Greed); or a much more vivid communication of hardship, labor, and exhaustion (though I wish, these had been brutally and meticulously presented rather than skilfully sketched); or more intelligent handling of amateurs and semi-professionals (notably the amazing character who plays Gold-Hat, the bandit leader); or a finer selective eye for location or a richer understanding of how to use it; or scenes of violence or building toward violence more deeply authentic and communicative (above all in Huston’s terrific use of listlessness); or smarter casting than that of Tim Halt as the youngest bum and that of Bruce Bennett as an intrusive Texan; or better acting than Walter Hnston’s beautiful performance; or subtler and more skilful collusions and variations of tempo (two hours have certainly never been better used in a movie); or a finer balance, in Ted McCord’s perfect camera work, in every camera set-up, in every bit of editing, of unaffectedness, and sensitiveness. (As one fine example of that blend I recommend watching for the shot of Gold-Hat reflected in muddy water, which is so subtly photographed that in this non-color film the hat seems to shed golden light.) There is not a shot-for-shot’s-sake in the picture, or one too prepared-looking, or dwelt on too long. The camera is always where it ought to be, never imposes on or exploits or over-dramatizes its subject, never for an instant shoves beauty or special meaning at you. This is one of the most visually alive and beautiful movies I have ever seen; there is a wonderful flow of fresh air, light, vigor, and liberty through every shot, and a fine athlete’s litheness and absolute control and flexibility in every succession and series of shots. Huston shows that he is already capable of literally anything in movies except the profoundest kind of movie inventiveness, the most extreme kind of poetic concentration, artiness, soft or apathetic or sloppy or tasteless or excessive work, and rhetoric whether good or bad. His style is practically invisible as well as practically universal in its possible good uses; it is the most virile movie style I know of; and is the purest style in contemporary movies, here or abroad. I want to say a little more about Walter Huston; a few thousand words would suit me better. Rightly or wrongly, one thing that adds to my confidence that the son, so accomplished already, will get better and better, is the fact that the father has done that, year after year. I can think of nothing more moving or happier than every instance in which an old man keeps right on learning, and working, and improving, as naturally and eagerly as a child learns the fundamentals of walking, talking, and everything else in sight until his parents and teachers destroy his appetite for learning. Huston has for a long time been one of the best actors in the world and he is easily the most likable; on both counts this performance crowns a lifetime. It is an all but incredible submergence in a role, and transformation; this man who has credibly played Lincoln looks small and stocky here, and is as gaily vivacious as a water-bug. The character is beautifully conceived and written, but I think it is chiefly Waiter Huston who gives it its almost Shakespearean wonderfulness, charm, and wisdom. In spite of the enormous amount of other talent at large in the picture, Huston carries the whole show as deftly and easily as he handles his comedy lines. There are a few weaknesses in the picture, most of which concern me so little I won’t even bother to mention them. Traven’s Teutonic or Melvillean excitability as a poet and metaphysician sometimes, I think, misleads him—and John Huston; magnificently as Walter Huston does it, and deeply as he anchors it in flesh and blood, the Vast Gale of Purifying Laughter with which he ends the picture strikes me as unreal, stuck-onto-the-character, close to arty; yet I feel tender toward this kind of cliché, if I’m right that it is one. One thing I do furiously resent is the intrusion of background music. There is relatively little of it and some of it is better than average, but there shouldn’t be any, and I only hope and assume that Huston fought the use of it. The only weakness which strikes me as fundamental, however, is deep in the story itself: it is the whole character of the man played by Bogart. This is, after all, about gold and its effects on those who seek it, and so it is also a fable about all human life in this world and about much of the essence of good and evil. Many of the possibilities implicit in this fable are finely worked out. But some of the most searching implications are missed. For the Bogart character is so fantastically undisciplined and troublesome that it is impossible to demonstrate or even to hint at the real depth of the problem, with him on hand. It is too easy to feel that if only a reasonably restrained and unsuspicious man were in his place, everything would be all right; we wouldn’t even have wars. But virtually every human being carries sufficient of that character within him to cause a great deal of trouble, and the demonstration of that fact, and its effects, could have made a much greater tragi-comedy—much more difficult, I must admit, to dramatize. Bogart does a wonderful job with this character as written (and on its own merits it is quite a character), miles ahead of the very good work he has done before. The only trouble is that one cannot quite forget that this is Bogart putting on an unbelievably good act. In all but a few movies one would thank God for that large favor. In this one it stands out, harmfully to some extent, for everything else about the picture is selfless. It seems worth mentioning that the only thing which holds this movie short of unarguable greatness is the failure of the story to develop some of the most important potentialities of the theme. In other words, “Hollywood,” for once, is accountable only for some minor flaws. This is what it was possible to do in Hollywood, if you were talented enough, had standing enough, and were a good enough fighter, during the very hopeful period before the November Freeze. God knows what can be done now. But if anybody can hope to do anything, I count on Huston, who made San Pietro and Let There Be Light as an army officer and The Treasure of the Sierra Madre as a Hollywood writer-director.